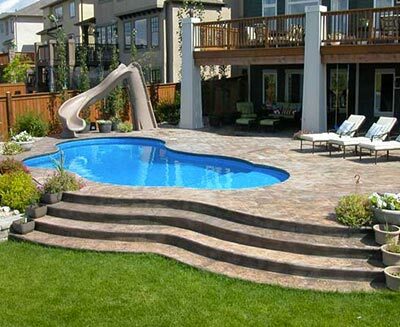 Discover the impact of unique stonework on your incredible new swimming pool and backyard. Learn about the cutting edge technology and amazing range of efficient products that will keep your Aqua-Tech pool looking beautiful and performing like a dream for years to come. With an Aqua-Tech design, the custom stonework you choose will work to enhance your beautiful swimming pool. For that reason, you should be able to access countless other custom options to create a final product that you and your family will love for decades–exactly the reason why Aqua-Tech’s custom features were developed. By working with our team to enhance your pool and backyard with our countless options, you’ll get an outdoor space that’s a seamless extension of your home. Our custom stonework capabilities range from flagstone decking and walkways to more involved projects like outdoor fireplaces that provide a warm alcove to enjoy at any time of year. Our team can execute any project regardless of complexity. 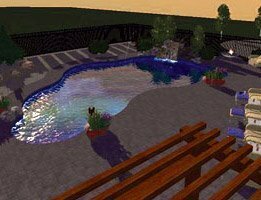 In the past, we’ve designed and built large, secluded grottoes, vast terraces that lead from the home to the pool, hot tub or outdoor kitchen and play areas for children. Aqua-Tech’s technicians also have extensive experience in creating intricate water features, including waterfalls and fountains, that are built to the exacting specifications you’ve come to expect from us. Winnipeg winters are cold and long and when summer finally comes we know that you want to stretch it out as long as possible. With that in mind, your pool design can easily incorporate a range of fire features like outdoor fireplaces, fire cauldrons and torches that not only look stunning but also let you take advantage of your pool in the evenings and as summer draws to a close. Everything was very professionally done, from the day you came to our house for the initial measurements and layout drawing of our yard, to finding out the best position for our pool, and the final installation. No two Aqua-Tech designs are alike and our team loves nothing more than the opportunity to bring innovative projects to life. Don’t wait to find out how we can add even more value to your backyard. Schedule your consultation today!